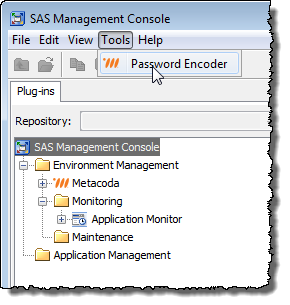 I was asked yesterday whether it was possible to use the SAS® Management Console BI Lineage plug-in to provide non-administrators with the ability to review BI Lineage scans (as previously run by administrators). The BI Lineage plug-in can be used to do impact analysis for BI content (reports, information maps etc.) in a similar way that SAS Data Integration Studio provides impact analysis for DI content (jobs, tables, etc). I’d never needed to do this before, so I did a little research. It didn’t take long to find the Granting Users Permission to View Scan Results section of the Using the BI Lineage Plug-in page in the SAS® 9.4 Intelligence Platform: System Administration Guide, Second Edition. That page explains how to open up access to the BILineage custom repository so that normal non-administrative users can get access to the scans (which are otherwise only available to unrestricted users). The document doesn’t get into explaining how to provide normal users with access to the BI Lineage plug-in itself so in this blog post I’m going to outline the steps required, with screenshots, to show the entire process. The end result of this process will be a BI Lineage Users group. You can then add normal non-administrative users as members of this group to provide them with access to both the BI Lineage plug-in and the scans in the BILineage repository. One of the nice enhancements in SAS® Management Console 9.4 is the addition of a point & click method for creating a Metadata Bound Library. Metadata Bound Libraries have been available since SAS 9.3 M2 but prior to SAS 9.4 you had to write proc authlib code to set one up (see this prior post for an example). Many of the SAS platform administrators I meet have an IT admin background, not necessarily a SAS coding background, so this addition of a point & click method in SAS 9.4 will certainly make it easier for people to take advantage of metadata bound libraries. I find it makes it easier and I do have a SAS coding background. I don’t create metadata bound libraries every day, so I haven’t committed the syntax to memory yet :). Using the point & click method can be quicker than tracking down a code example. 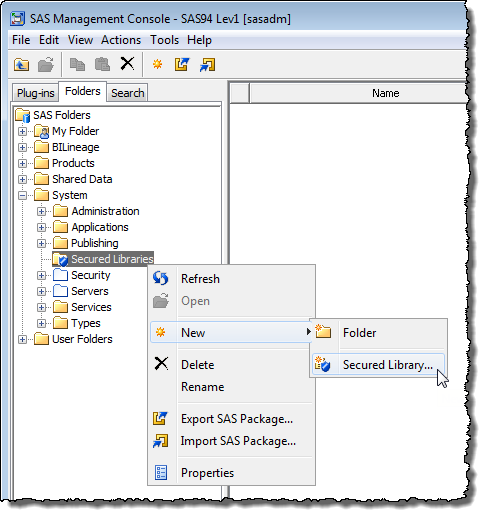 Starting from the Folders tab in SAS Management Console 9.4, navigate to the /System/Secured Libraries folder. Right mouse click over the Secured Libraries folder and select the New and Secured Library menu items. I’ve noticed that whenever I need a pwencoded password, it seems to coincide with me not having a SAS® coding interface readily available (DMS, SAS Enterprise Guide®, SAS Data Integration Studio etc.). On the other hand, I almost always have a SAS Management Console session open. For this reason I’ve added a small Password Encoder utility to our Metacoda Plug-ins product which will be available in the next maintenance release (3.0 R4). What’s more, this Password Encoder will be a free-of-charge utility along with the existing ACT Reviewer and Metadata Explorer. Sometimes you find yourself wanting to repeat a SAS® software installation or deployment with the same, or slightly different, options. Perhaps you want to start an installation again after realizing that you chose a wrong option the first time around. Maybe you want to test out a slightly different configuration. It might be that you are planning on doing multiple client installs, choosing exactly the same settings each time, and want to automate the process. For all of these reasons, you might be interested in the SAS Deployment Wizard’s ability to record an installation and replay it later. You might make the replay automatic and silent so there is no interaction, or you might just want to use the smart defaults from an old installation and make a few minor changes here and there. It’s such a handy feature, that you might even decide to always record your installs, just in case you need them later. The Automating the SAS Installation on Multiple Machines section of the SAS® 9.4 Intelligence Platform: Installation and Configuration Guide. I’ve listed the SAS 9.4 documents above, but there’s equivalent documentation available for the earlier SAS releases too. If the response file already exists it appears to be overwritten without reading the contents. I haven’t yet found a way to get the SAS Deployment Wizard to read an existing response file, make changes and save an updated or new response file. If someone knows how to do this please let me know. The SAS Deployment Wizard has several other options and modes that you might find useful, so check the documentation for more info. If you have any extra tips for using response files with the SAS Deployment Wizard, please let me know by leaving a comment below.